In my trends report post I mentioned I hadn’t quite figured out what my ‘vibe’ was going to be for A/W’18, but for now I think I’ve found my go-to outfit before the temperatures really cool down! Dress, Nobody’s Child via ASOS (available here). Bag, Topshop. Earrings, Primark. Necklaces, Accessorize and Monki. Ring, Bimba & Lola (old). Trainers, New Look (available here). 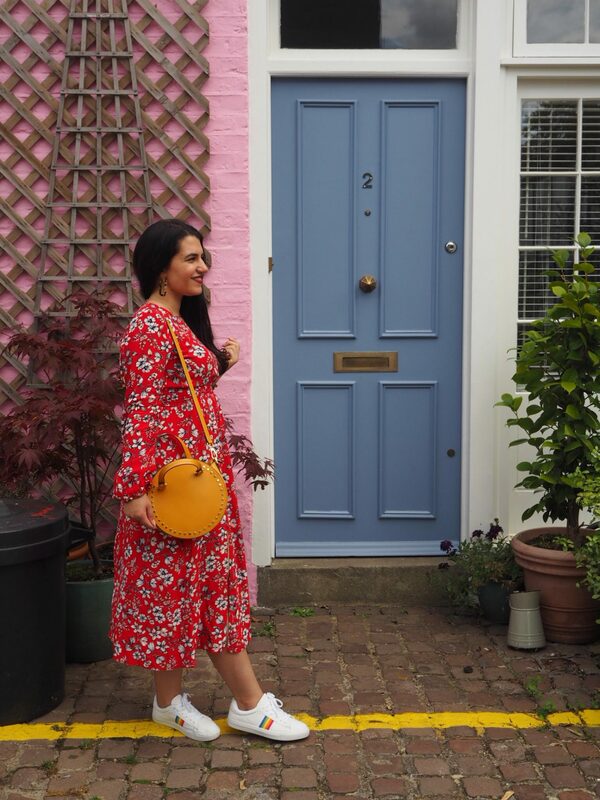 A few years ago I never would have thought I could pull off midi and maxi dresses, let alone match them with trainers. 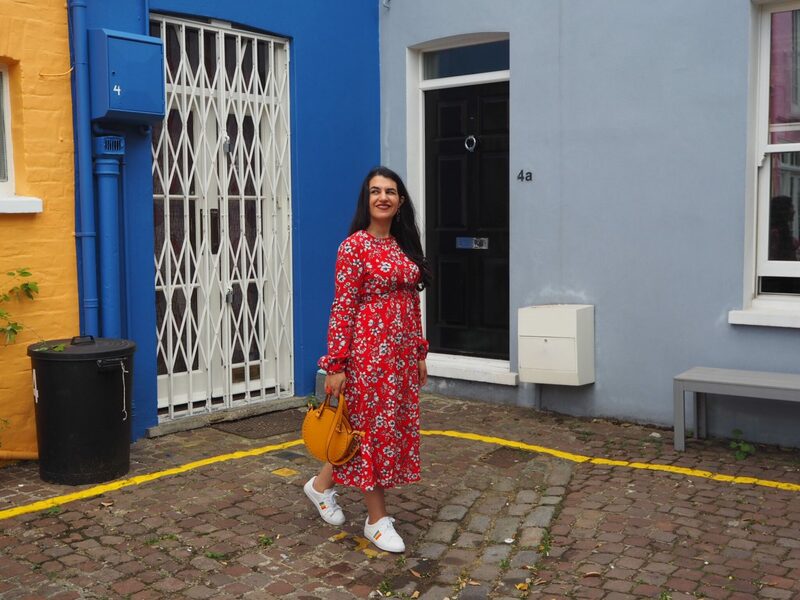 But as I grew to love and live in midi skirts, I guess it was only a matter of time before I took the plunge and gave midi one-pieces a go. 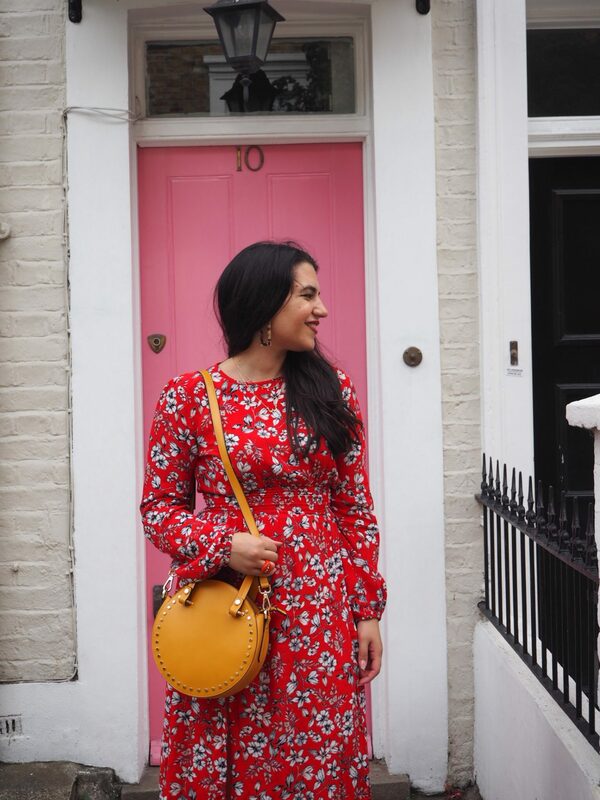 When I saw this dress on blogger Hannah Gale (who, like me, is also relatively petite) I fell in love and had to have it. 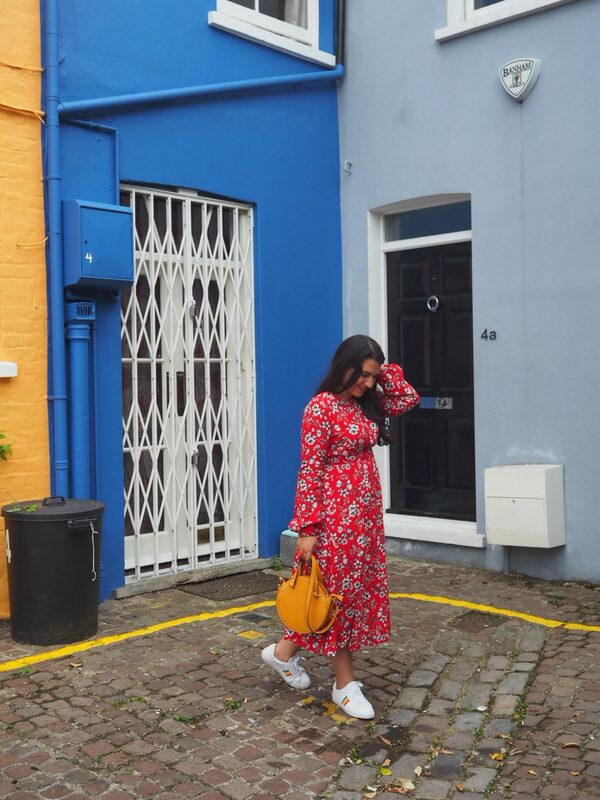 It’s one of the longest dresses I’ve got – it ‘feels’ even longer than this one from Topshop, which has a super airy feel and doesn’t ‘feel’ that long. And yes, rainbow trainers. Aren’t they adorable? 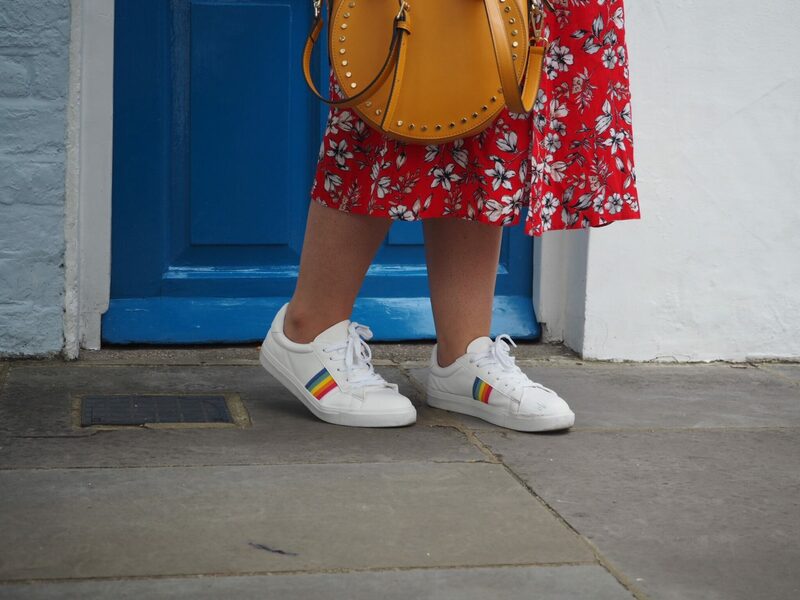 I do struggle with white trainers as they make my feet look so bulky, but have always understood their appeal. 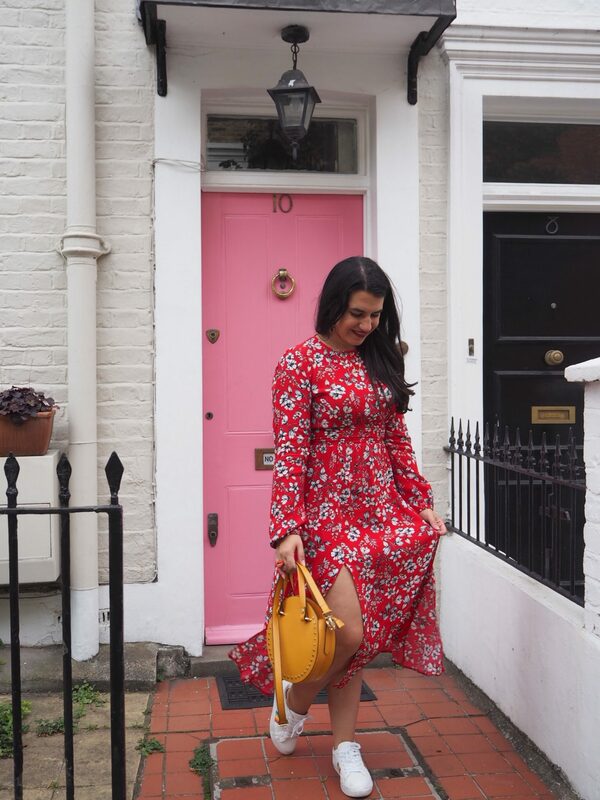 I envisioned wearing this dress with white trainers and when I spotted this pair I fell head over heels for them. 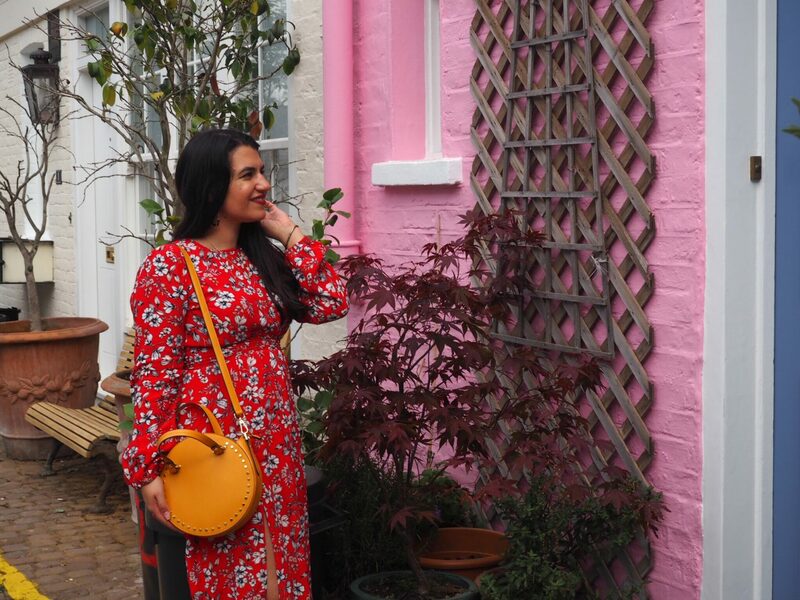 I love the rainbow and flower print clash – it’s a miss-match that I think adds a little quirkiness. Now my main mission with these trainers is to keep them as clean as possible. 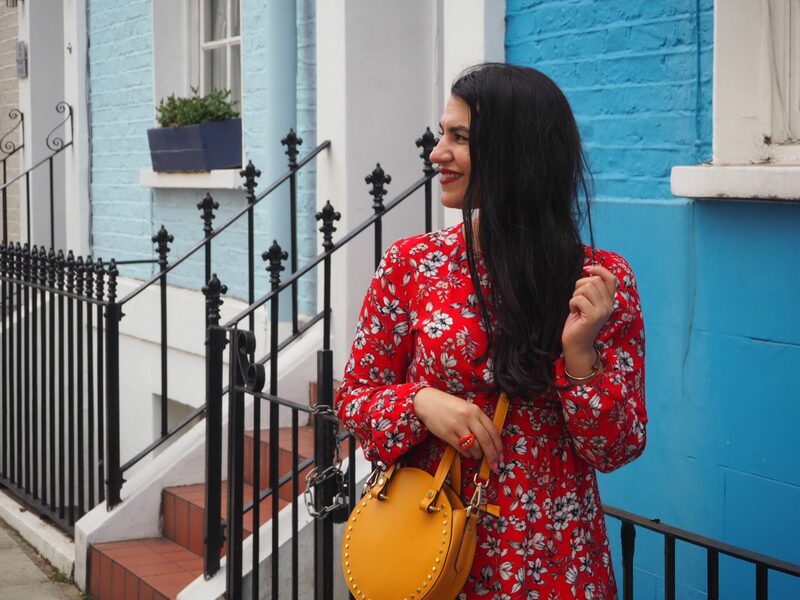 I added a little more mis-matching with these earrings from Primark – I’ve always had a soft spot for tortoiseshell, which seems to be a huge jewellery trend this season and in my opinion seems to pair with just about anything. But let’s talk about the big elephant in the room – or more like the big elephant in my wardrobe. 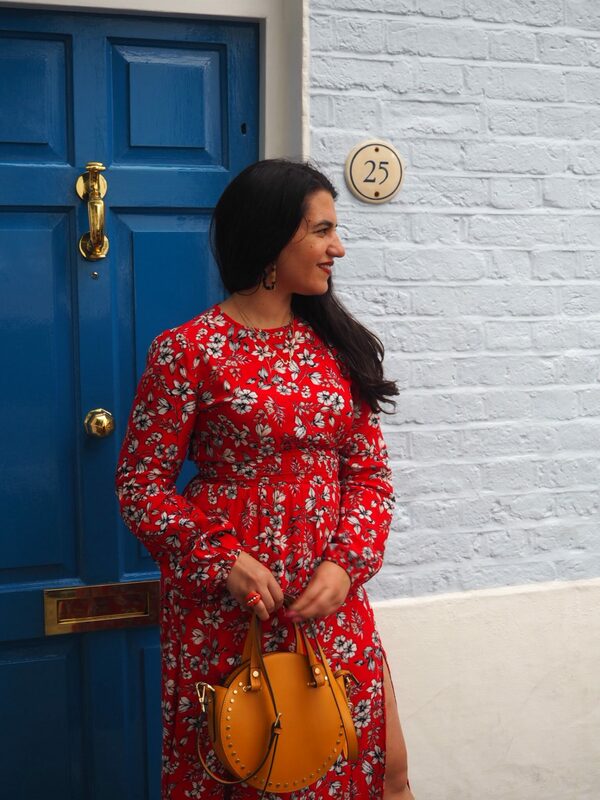 I’ve now officially lost count of how many red floral dresses I own (the aforementioned Topshop one as well as this one and this one come to mind, but there are more). 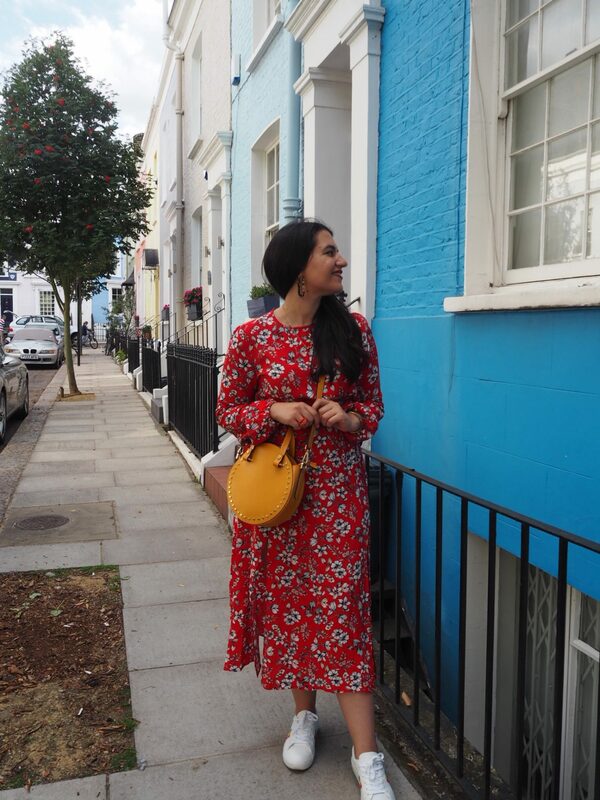 But red is my colour and what can I say, I feel happy in a red floral dress. And in all honesty I do feel they are all very unique in their own ways – this one in particular is so different to anything I’ve owned before. 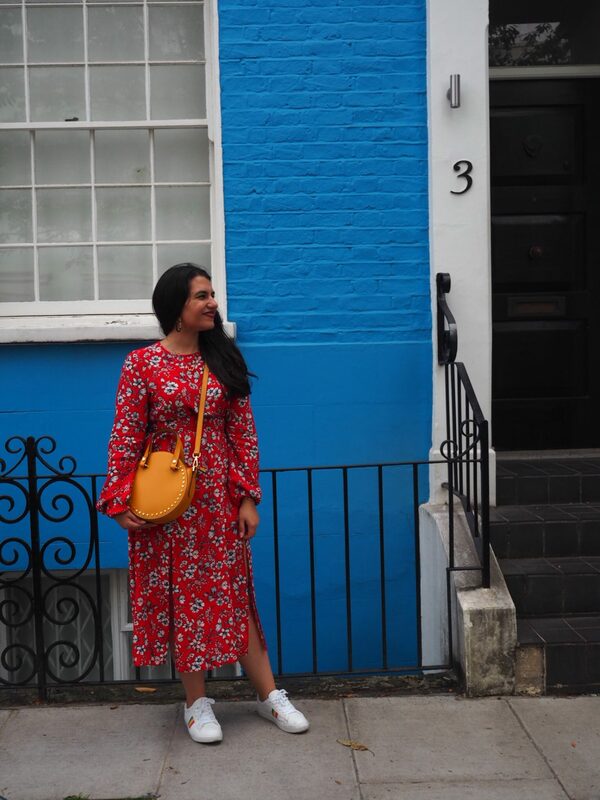 My friend took these pictures of me around the pretty streets of Notting Hill less than two weeks ago, so I think it’s fair to say this dress is what the fashionistas would totally call a transitional outfit, am I right? 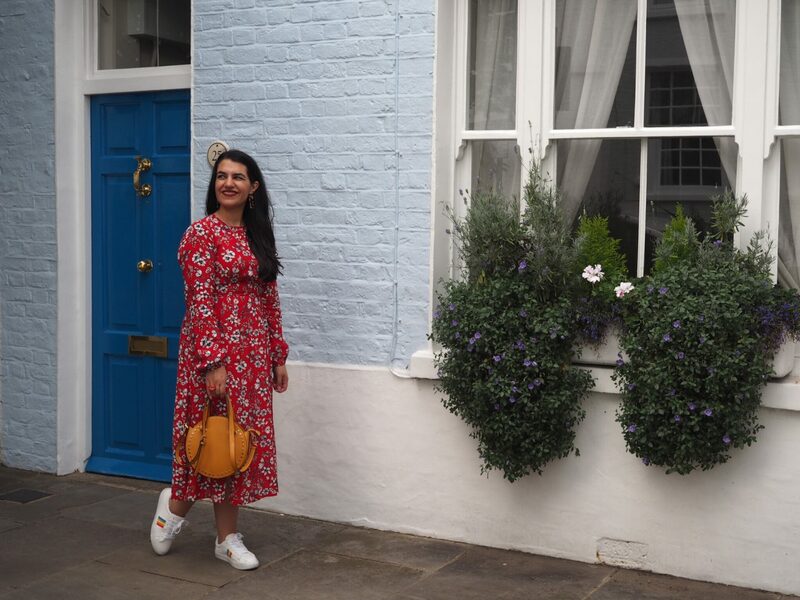 I for one can’t wait to wear it again – I just love finding failsafe outfits that make you look and feel good! Pictures taken on September 9th, 2018 around Notting Hill, west London.